TheArmenianKitchen.com : Lamb for Easter? It just seems right. Everyone is Armenian on Easter. At least, that's how it seemed when I was growing up. We Armenians eat lamb all year long in every way you can imagine, plus a few more. Skewered, stewed, broiled, braised. Cured and dried into sausages. Boiled and preserved in its own fat. To me, it's all great. I never understood why my American friends turned up their noses at the very mention of lamb. They never understood either once they'd eaten at our house, where nobody ever turned down seconds. Lamb was a mystery to them because it was absent from most American tables most of the year, until just about now. That's when the young lambs were slaughtered and signs suddenly sprang up in supermarket windows: Spring Lamb Is Here! Even at steak houses, leg of lamb emerged from the thumb-stained bottom of the menu to become the centerpiece of the Easter feast. Spring lamb is an ancient rite that cuts across cultural and religious lines. To the Jews at Passover, the Paschal lamb is a sacrifice to God. To Christians, lamb at the Easter table symbolizes The Lamb of God and His sacrifice for mankind. As a kid, I didn't get it. To me, eating lamb was no sacrifice. It was just...dinner. But oh, what a dinner! Done well, a leg of lamb is so delicious, so succulent that almost any side dish pales. And to Armenians, lamb done well means lamb well done. You are horrified? Turn off the Food Network for a few minutes, take a deep breath and consider this: Rare lamb is rarely served in the oldest food cultures of the Near and Middle East. Greeks, Assyrians, Arabs and the rest all cook their lamb thoroughly. You have to figure they know something after a few thousand years of practice. What they know is that the key to a tender and juicy roast lamb is fat. Not inside, but outside. Ask the butcher for a roast with a thick layer of fat on one side and cook it fat-side up. The fat will seal and baste the meat. It will also add flavor. In fact, you don't need to do much more. One of the American myths about lamb is that it has a strong taste that has to be covered up. If your lamb tastes that way, it's just bad lamb. Fresh, young lamb is almost sweet and easily takes on the flavor of subtle seasonings. This recipe is a typical Armenian preparation. Serve it with pilaf, salad and fresh bread and you'll have a grand holiday dinner. Just skip the mint jelly. You won't need it. If you want mint flavor, add some fresh mint leaves to your salad. 1. In a small bowl, combine the ground coriander, salt, and pepper. Blend well and set aside. 2. Place the oven rack as close to the center as possible, then preheat to 350° F.
3. Line the bottom of a roasting pan with heavy-duty foil. 4. Spread the cut onions, garlic, and ½ cup of water on top of the foil. This will impart a lively flavor, and fragrance to the recipe during roasting. 5. Place a roasting rack over the onion mixture. 6. Place the lamb on the rack, fat-side up. Leaving the fat on will flavor and moisten the meat. 7. Sprinkle the coriander, salt and pepper on the surface of the lamb, gently rubbing them in. 9. 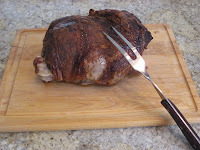 Remove the roast to a carving board, allowing the meat to rest for about 15 minutes before slicing. 10. Serve with pan juices that have been skimmed of fat. Special Note: Do Not discard the juices at the bottom of the pan! When cooled, strain the juices into a food storage container, discard the onion & garlic. Refrigerate overnight. Remove the layer of fat which hardens on the top. What’s left is a flavorful broth to use as a base for soup or sauces. Sounds marvelous. I never understood mint jelly anyway.